Recently, I got a new PC and had serious problems with the stability of Office 2016. Outlook kept crashing all the time, Word sometimes even crashed when running in background. All Office incl. Excel and PowerPoint have not been stable. 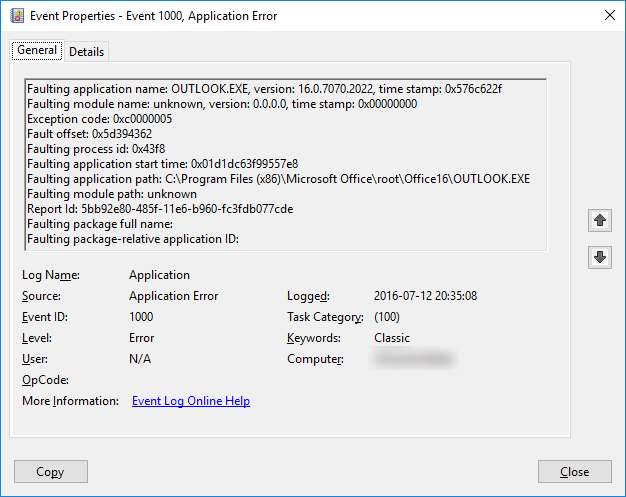 Most of the time I got error 1000 in the application event log, in most cases without a faulting package (e.g. add-in). All usual attempts to solve the problems failed. I deactivated plugins, followed the recommendation of the Microsoft Office Configuration Analyzer Tool (OffCAT), created a new Outlook Profile, reset my Outlook OST files, removed and reinstalled Office 2016. I checked my memory, exchanged my Bluetooth adapter, scanned my file system for errors, ran several anti malware tools, updated drivers for several components, patched all applications and repaired Windows 10. Nothing helped all. After two weeks of research on my own, I opened a support case with Microsoft, but they had no helpful ideas either. At least they gave me the hint, to check “Disable Hardware Graphics Acceleration” in the Outlook options. This reduced the number of crashes a little, but I still had crashes. I found some forum posts in Microsoft’s forums, Intel’s forums and some user groups. People claimed to have solved the problems by either replacing the built-in Intel Graphics Adapter with a 3rd party adapter or by switching from Office 2016 32 Bit to Office 2016 x64. As my HP EliteDesk PC does not allow to add another video card, this was no option for me. But I tried to switch to Office 2016 64 Bit. I removed Office 2016 32 Bit including dedicated Office applications, such as Visio, and all installed language packs. After a clean reboot I installed Office x64 from scratch. This has solved my problem entirely. In my case, it has been an Intel Core i7-6700 processor (Skylake architecture) with an integrated Intel HD Graphics 530 chip. Other processors, generations or graphic chips might have the same problem.